Back when we lived in our first place in Oakland we had less space and no kids. It was the time in my life when my love of dogs was most pronounced and I was rather focused on the idea of having a Chinese Crested dog. Mostly we are rescue dog people and yes it is true that this breed does spawn some of the ugliest creatures known to dog (see example here), but when well bred they can be quite fabulous (see example here). 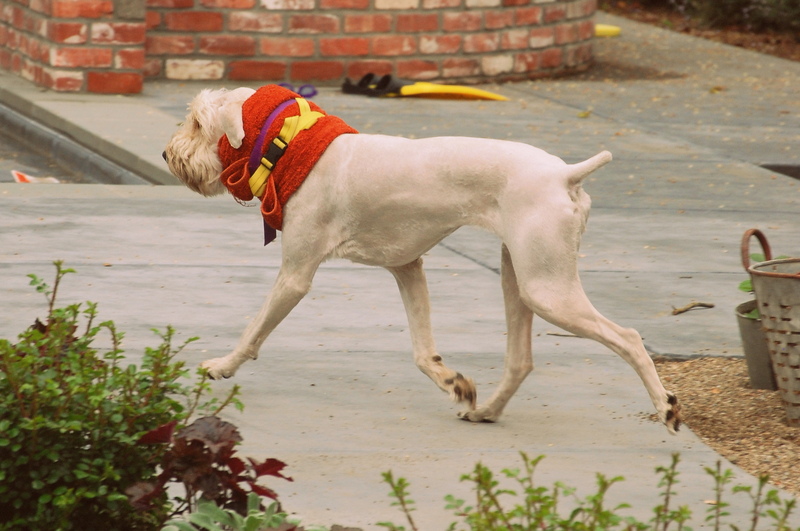 Half of most litters are actually covered in hair, but you can give them “pony” cuts like that last picture and leave a little short hair covering their bodies along with the flowing “furnishings” so you don’t have the naked dog ick factor. Then you end up with the most hilarious and appealing (to me) dog ever- like a Clydesdale and a fairy had a puppy! Well, B had to draw the line. He is a man of relatively few limits in terms of tolerating my animal related ambitions, but a Chinese Crested was not something he could have. Just couldn’t do it. So ever since then I think I have been taking out my desire for one of these strange and delightful creatures on the other dogs I groom. Bonny is the latest victim. 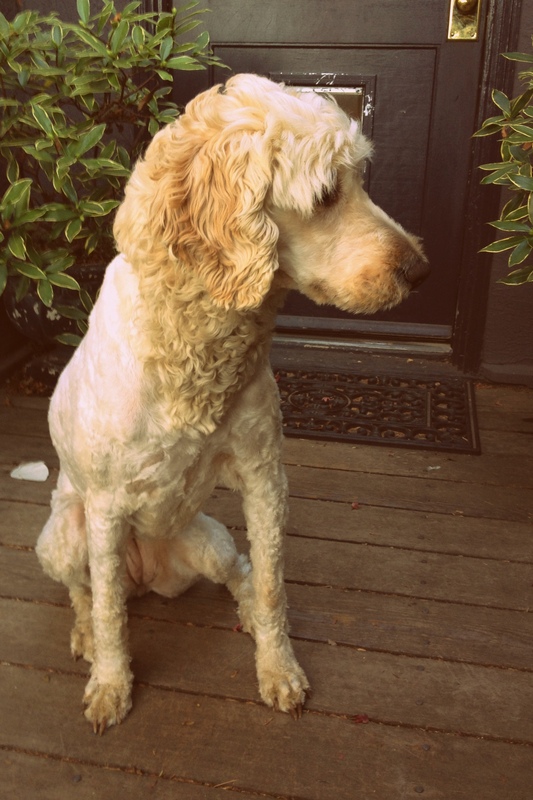 Doesn’t everyone wonder what their Doodle would look like in a blond wig? With most dogs I have found that their coats and my amateur skill level are really the only limiting factors in getting the hair-do I want, but with Bonny if I clip her too short she gets so itchy she tries to chew off every scrap of hide she can reach with her chompers. How short is too short? Well, I shave portions of my sister’s poodles down close enough for emergency surgery (#40 blades) but Bonny can’t even handle #10 blades. She is a #7 or less kind of a girl. Admittedly, something about the color of her coat with her pink skin peeking through doesn’t look very appealing at a #10 length, so perhaps it’s all for the best. Bonny, looking more like something you might find aging in a meat locker than the fluffy gal we usually encounter. We tried the standard plastic Elizabethan collar (those lampshade shaped dog torture devices you get from the vet) to save her from herself, but she was soon the hard plastic was gouging out the flesh from her neck in her attempts at itch relief. The donut shaped, inflatable collars were no match for her super flexible noodle-dog physique. Enter: the DIY Elizabethan dog collar. Thank you, internet! 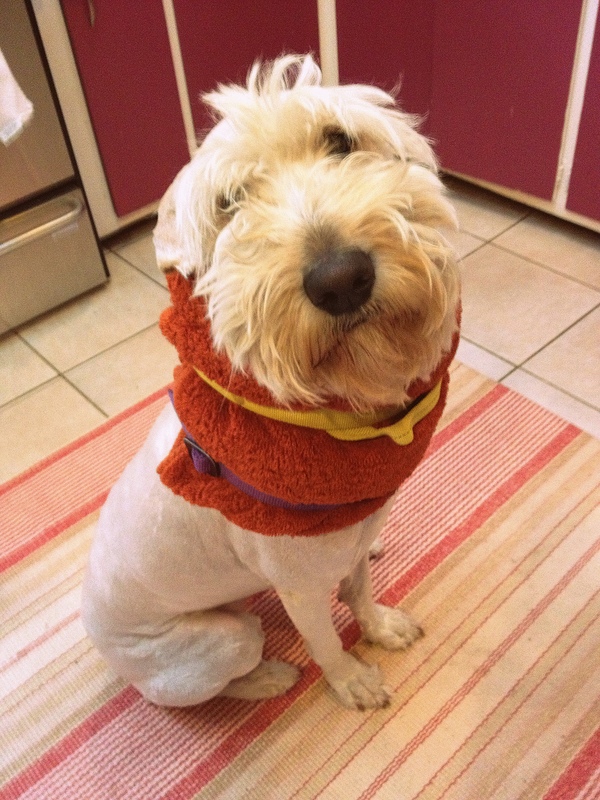 Basically you take a thick towel, fold it into thirds lengthwise and wrap it very snugly around the dog’s neck. Secure with the webbing belt your husband has saved since middle school and another strap that clips together unearthed from the mound of climbing gear lurking in your front hall closet (or similar). Very simple and effective. That’s it! This entry was posted in Animal Husbandry and tagged dogs, elizabethan collar, Goldendoodle on February 5, 2014 by fullheartsfarm.